Back in December 2015 it was reported that four Borneo Bears National players had been invited to join the Darwin Waratah’s to train and play in the 2015-2016 NTFL season. "One of the major highlights for 2015 which was organized and championed by Bears President Tommy Commerford and Bears Coach Shane Kruger, was a cross country AFL development agreement between the Borneo Bears and the Darwin Waratah’s". Today in the NT News we see how this experiment has progressed, "WARATAH’S bold experiment to bring four Borneo-born footballers to the Top End paid dividends yesterday when utility Timbul Kukuh Santoso played his first league game. The 22-year-old “Borneo Express’’ roamed between half forward and half back, producing a 12 possession game that showed he is comfortable at that level." Vietnam to host 2016 Asian Championships. 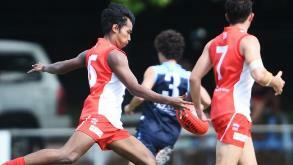 The Vietnam Swans will host the 17th AFL Asian Championships at RMIT Saigon campus on Saturday 15 October, 2016. 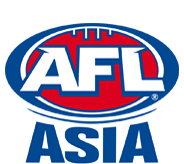 Confirmation was announced at the AFL Asia Annual General Meeting which was held on January 27th 2016. This will be the first time that the Swans will have hosted “Asian Champs”, which saw over 400 competitors travel to Bangkok in 2015. The new two-division format with a 12-a-side second division focussing on a commitment to promote local development was hailed a big success in Bangkok and will be continued in Saigon. The 2015/16 season for the Waratah Warriors in the Northern Territory Football League has largely been one to forget. Whilst the fixture shows a winless season to date, the club has used the year as a developmental period to grow the next crop of star players ready to again see finals action. Part of their experiments involved the opportunities given to four Borneo players, one of which played his first senior game recently. The following article from Grey Morris at the NT News gives the details of their journey. WARATAH’S bold experiment to bring four Borneo-born footballers to the Top End paid dividends yesterday when utility Timbul Kukuh Santoso played his first league game. Indonesia has gone through a huge change over the past 3 to 4 years in regards to the energy sector which has led to a great number of expats leaving Indonesia and particularly from Balikpapan, the center of energy in Indonesia. Back in earlier days the expat players would invite their Indonesian national drivers and office staff down to training and consequently fund them to local tournament tours, it was expats that formed 90% of the club players list and membership. However, The Borneo Bears through a number of methods with great support and perseverance from the Bears Committee, has survived the exodus of expats and the Bears have turned their player list around which now constitutes approximately 90% Indonesian National players and continues to grow. The Tokyo Goannas triumphed in the AFL Japan Grand Final played out on Saturday 21st November at the Yokohama Country and Athletic Club. 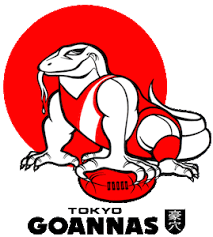 In what turned out to be a 'come from behind' thriller, the Tokyo Goannas over came a Tokyo Bay Suns three quarter time 11 point advantage with a 4 goal to 2 goal last quarter to take out their seventh Top League Grand Final by a mere 2 points, final scores being 10 - 8 (68) to 10 - 6 (66). 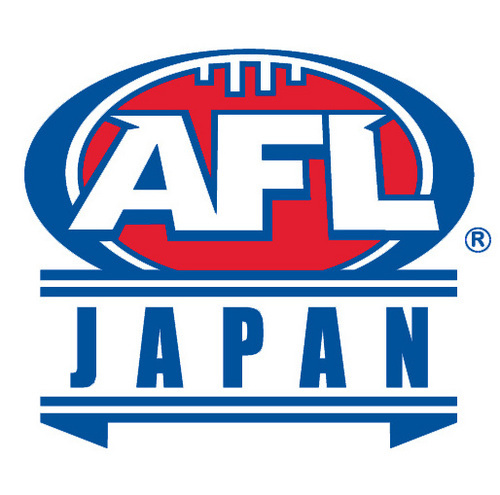 It was a hard fought battle from the outset between the two powerhouse teams in the AFL Japan Top League East, with the Suns kicking away to 4 goal to one first quarter. The Grand Final for AFL Japan will be played this Saturday 31st November, the match will be a battle between two powerhouses of Japanese footy. Two-time reigning premiers Tokyo Bay Suns will battle it out against the multi-premiership winning Tokyo Goannas with the Goannas probably being the warm favourites as they made their way into the Grand Final by crushing the Senshu Powers last Sunday 22-14 (145) to 9-8 (62), whereas the Suns fended off the Komazawa Magpies in a memorable First Semi-final 14-8 (92) to 9-11 (65). The Grand Final will begin at 4.25 pm at the Yokohama Country and Athletic Club, 11-1 Yaguchidai, Naka-Ku, Yokohama, Kanagawa. This month in Kolkata, India, the annual AFL India National Championships – the ARFAI OGM Cup - Australian Rules football tournament was held. The tournament has continued to grow – both in numbers and standard – over recent years. This year’s event was won by the Bengal Tigers over the Jharkhand Crows. The final score war the Tigers 2 6 18 down the Crows 2 1 13. The following article from the Koltata Konnector website, written by Abhijit Ganguly, takes a closer look at the growth of the game in India in the wake of the tournament. The game was officially born 156 years ago when in 1859 its rules were codified four years before soccer even had a codified set of rules, but it had been played for several years before that across the southern states of Australia. 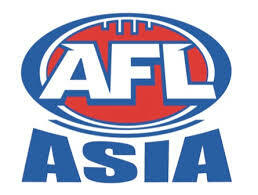 The following article from the AFL Asia website gives a wrap of the recent Asian Champs tournament in Bangkok. The Hong Kong Dragons took the Division 1 title, whilst the Laos Elephants celebrated winning the title in Division 2. The Hong Kong Dragons have restored their claim to being the most successful team in Asia following their 6th AFL Asian Championships victory, defeating a gallant Malaysian Warriors team 4.11.35 to 2.3.15 in what many have described as the most successful ‘Asian Champs’ in the 16 year history of the event, this year hosted by the Thailand Tigers at the Harrow International School in Bangkok on Saturday 17 October. Playing their 5th straight Asian Champs Grand Final, the experience of the Dragons in managing a large roster of players to get through the biggest day of footy in Asia shone through, running over the Warriors in the second half to put the Dragons back on top of Asian footy after last year’s Grand Final defeat to the Singapore Wombats. 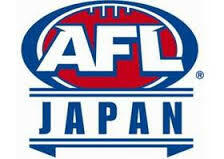 On October 10th, 2015 teams from across Japan travel to Chiba, just outside of Tokyo for the much anticipated 4th AFL Japan Cup. In what was a welcome change from the torrential rain of previous years, the weather held up to allow for a massive day of competitive football from seven of Japan’s clubs. There was some doubt heading into the tournament as to who the favourites would be as one of the JAFL’s powerhouse clubs, the Tokyo Bay Suns decided to join forces with competition debutants, the Miyazaki Grandswells, while veteran clubs, the Eastern Hawks and the R246 Lions merged toform a formidable team for the tournament. Throw in the Senshu Powers, Tokyo Goannas, Komazawa Magpies, Shonan Poseidons and the new team from Sendai Port, and it was the scene was set for a special day. The competition started with a round robin of matches where each team played each other once with the highest finishing teams then contesting for the cup in the finals. The initial rounds saw some aggressive, bruising football as all teams were out to win their early games. 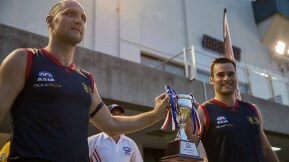 The 16th AFL Asian Championships, to be held this Saturday 17 October in Bangkok, is set to be the biggest and best ever, with record numbers of teams, local player initiatives and a new 2-division format. 13 teams from across the Asian region will descend on Bangkok this week, with the Singapore Wombats looking to defend their 2014 “Asian Champs” title against six other teams in the new First Division, including the Hong Kong Dragons, Jakarta Bintangs, Malaysian Warriors, Philippine Eagles, Vietnam Swans and hosts the Thailand Tigers.